Bondi ice skating rink right by the beach! Sydney “Winter Festival” Ice Skating at Bondi Beach and more!!! Ice Skating at Bondi Beach! Join the Winter Festival in Sydney!!! Every year down at Bondi Beach you can join in with the fun and try ice skating outdoors in hot Australia! Bondi Beach ice skating rink by the sea! Ice skating at Bondi Beach July 2014! Only a few days left before it ends! 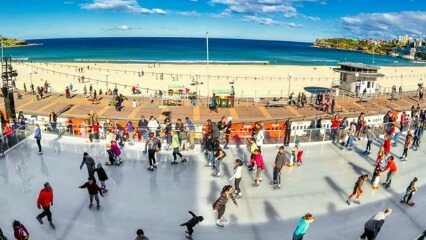 Ice Skating Bondi Beach – ends soon! Anybody who hasn’t been ice skating down at Bondi Beach best get their skates on as it will soon end on the 17th of July! You would like to experience winter in Sydney, but can’t find any ice in Sydney? Why not have a go down to the ice skating-rink right in front of the world famous Beach which begins with the letter ‘B’! If you have been celebrating Germany’s victory in the world cup, then you can also get some traditional German sweet hot wine while skating at the open air ice rink. The official start for the Winter Festival is the 29th of June and it runs until the 17th of July. If you would like to get to Sydney to enjoy the Winter Festival then Travelwheels Campervan Hire Sydney offers cheap campervan hire deals starting from Sydney. July is a great time to hear north and go to Cairns. Here are a couple of useful links for when the next Bondi Ice Skating Festival is on, and check out Bondi Winter Magic link. Have a nice week and we hope to hear from you soon!!! If you are looking for good value for money campervan hire in Australia, then check out Travelwheels Campervan Hire Sydney. We have a range of 5 different types of campervan for rent and all at good prices as well! We will do our very best to give you the lowest prices for Sydney to Sydney Campervan Hire! We will match all our competitor quotes for Sydney to Sydney Campervan Hire! All you have to do is enter your dates below and then click on the search button! You will automatically get the lowest price for your route.